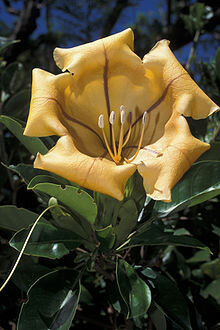 This is a native to Mexico and South America.Large urn shaped yellow/tan coloured flowers in Spring, Summer and Autumn. The flowers have a most gorgeous coconut/banana perfume. This climber need support from a pergola or lattice. It is deciduous in temps down to -7C and evergreen in warmer climates. Some protection from severe frost is required. Height to 5m. Width to 3m.